Coming from Chicago, Louis B. Easton and his family arrived in Pasadena, California in the winter of 1902. It felt like paradise--the mild climate, lush gardens and people similar to themselves. The town, founded by Midwesterners only twenty-eight years earlier, was still small and surrounded by acres of fragrant citrus groves. The San Gabriel Mountains rose sharply to the north. From dawn to nightfall they were a constantly changing backdrop as sun and shadows moved across their face. The Santa Fe Chief from Chicago passed through Pasadena, its last stop before Los Angeles. The town had become a popular winter retreat. From the station visitors were taken to resort hotels close by like the Green or Maryland, or shuttled to the Raymond or Wentworth farther away. Several hotels offered guests the option of a detached garden cottage. In this apparent Garden of Eden many travelers decided to stay. A growing and affluent population provided new arrivals like Easton opportunities for work. He was soon building houses-- not the elegant mansions typical of Orange Grove Avenue, but small redwood houses nestled into the landscape. For those attuned to California's romance these rustic bungalows seemed to best express a new social freedom of gracious and simple living. 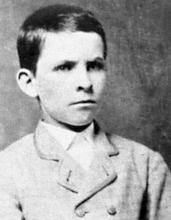 Easton (1864-1921) was thirty-eight when he moved to Pasadena. He was raised in Halfday Lake, Illinois, a small farming community north of Chicago. Like many of his generation he learned a variety of skills growing up on a farm and working alongside his parents. Family farms prepared young people to become productive and resourceful adults. Easton's character was shaped by the prevailing Middle Border values—self-reliance, hard work and iron thrift. These 19th century values had been essential when the Midwest was on the frontier of westward expansion, yet persisted in its culture as life became more secure. Easton trained to be a teacher at the Bloomington (Illinois) Normal School, and graduated in 1890. One of his classmates was Honor Hubbard, and they became friends. She was the youngest sister of Elbert Hubbard, who in 1895 founded the Roycroft community in Buffalo, New York. The Roycrofters began the Arts & Crafts guild to revive handicraft, and demonstrate an alternative to factory production. 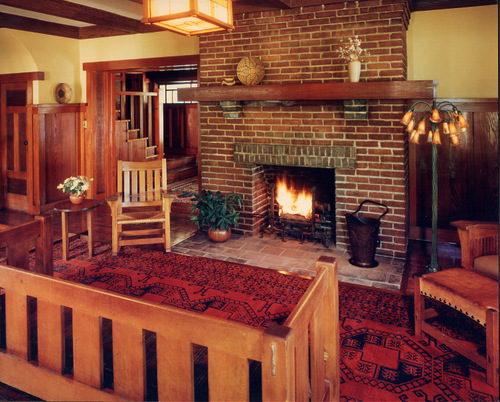 They designed and made furniture, metal work and books, and began the Roycroft Press to trumpet their efforts. Hubbard became well known as a writer and leading proponent of the Arts & Crafts Movement in the U.S. after 1900. Easton and Honor Hubbard married. The newlyweds moved to Lemont, Illinois with the promise of a teaching job for Easton at the high school. Easton taught manual arts training, and in 1893 was made Principal. A 1908 feature in Country Life in America by Carlyle Ellis described his work at Lemont High School: "Backed by a few wealthy men, he organized classes of poor boys and taught them, with success, to make beautiful things with their hands." At this time, the purpose of manual arts training—mostly woodworking and metal-smithing—in public schools was not to separate boys into vocational or academic paths, but to encourage development of skills many received at home or on a farm. Even boys from disadvantaged backgrounds would likely have manual skills to develop. 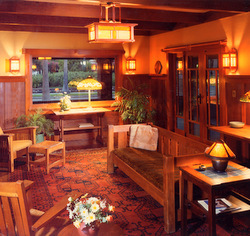 Easton built several pieces of fumed oak furniture in the new Arts & Crafts style similar to Roycroft designs. They were likely intended as demonstration pieces for the students. Several were exhibited in the 1903 handicraft exhibition at The Art Institute of Chicago. By 1902 Easton's health had deteriorated and he suffered respiratory problems from asthma. California, the fabled land of recovery and new hope, beckoned. As the new school year approached, Easton decided to resign and relocate. The family, now with three small children, packed their belongings and headed for Pasadena. They settled into a rented house. By 1904 Easton was back on his feet and working as a handyman. One of his first clients was D.M. Linard, Manager of the Maryland Hotel on Colorado Boulevard. The Eastons soon bought two adjacent lots on South Marengo Avenue. The street was shaded with pepper trees on both sides and one of Pasadena's prime residential streets. Across from their property was The Vineyard, a favorite residential hotel for winter visitors, and just south was the mansion of Congressman McLaughlin. In February,1905 Easton secured a building permit for a house on the south lot. The Eastons had selected a design from a pattern book, a common practice then. The design was a 1.5 story bungalow, eight-rooms, with side-facing gable roof and a wide dormer in front. The house would face west and included a deep inset porch with boulder foundation walls. Everything would be designed in sympathy with the Arts & Crafts style, as featured by the Roycrofters. How close the Eastons were to Elbert Hubbard is unclear. No letters between them have survived. 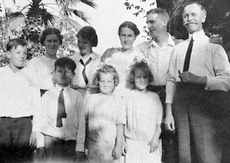 Hubbard did make several trips west to Los Angeles and Pasadena during the period they lived there. 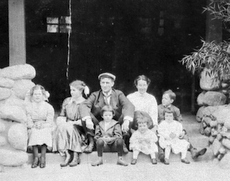 The Easton family album includes a photograph of Elbert with the Eastons' daughter on the porch of the grandparents' house in Illinois. We can assume Easton was well aware of Hubbard's work and celebrity. Builders of this era used local materials as much as possible. The tumbled granite boulders found along Pasadena's Arroyo Seco were gathered and hauled by buckboard to many building sites. The stones could be stacked and mortared for foundations. Redwood was plentiful in northern California. Once logged and milled the lumber could be shipped south by rail. Redwood siding was considered the best. It was handsome, easy to work, resisted termites, and could be left unpainted. Easton used it for their own house, clapboard on the first floor walls with shingles above. Interior photographs made soon after they moved in show the living room, dining room and study are linked spaces across the front of the house. Three-quarter height partitions with end posts define the rooms, but they remain open to each other. Redwood joists and ceilings are exposed. A wainscot at plate rail height unifies the doors and windows with built-in buffet. A large fireplace is the central focus of the space, made of dark red brick. Also seen are Easton's Arts & Crafts pieces exhibited at the Chicago Art Institute. After completing their house Easton turned his attention to the north corner lot. In October 1905, he acquired a building permit for a 1.5 story house. The cost was estimated at $4000, an ample budget when many single-story bungalows were built for half that amount. Easton designed this one himself, chalet-style with cross gable roofs, deep overhangs and open truss-work in gable ends. A recessed porch and wide plank door faced Marengo Avenue. Along the side street Easton planned a Japanese torii gate and fence to enclose the backyard. Interiors were similar to the first house with exposed natural redwood for main floor ceilings, built-in bookcases, dining room buffet and custom light fixtures. To give the redwood a more refined look, Easton used a wire brush to smooth and raise the grain. This is a traditional Japanese technique to accentuate the natural character of the wood. Easton may have seen it used at George Marsh's "Japanese Tea Garden" (1904) built only three blocks away, at California Boulevard and Fair Oaks Avenue. This house was built for sale and more impressive than his first one. When it sold quickly Easton realized they would be able to stay in Pasadena and build houses for a living. He hung a sign on the front porch: "Bungalows and Furniture." 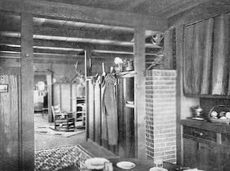 Easton's new business was given a boost when the first house he built appeared in the December,1906 issue of The House Beautiful, receiving national exposure. Local writer Una Nixon-Hopkins praised the design as a well-integrated "combination of the economical, practical and artistic." 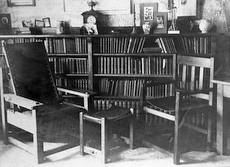 She noted that Easton's study faced South Marengo and was outfitted as an architect's office. "Here more plans are being made for bungalows... There is demand for his work, being his own architect, contractor, and overseer." Combining all three roles was a departure from common practice at the time. By offering a design-build service Easton increased control over his projects, enabling him to develop designs directly with clients and evolve them through construction. Many new arrivals to California in this era (1900-1915) saw the West and Hispanic heritage through the eyes of Helen Hunt Jackson. Her popular 1884 novel, Ramona, was written to alert readers to the plight of Native Californians, but was more often seen as a romantic introduction to the unspoiled region. Readers could imagine themselves recreating the idyllic settings she portrayed before the arrival of the Yankees. Her view of Southern California in the 1870s was of a beautiful, yet tragic landscape. The Mexican ranchos were threatened and in decline, but still held true to a slower paced life in harmony with the land. 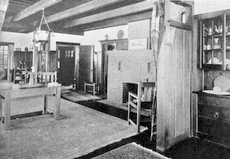 Jackson described the low-lying adobe houses with covered verandas surrounding a garden courtyard as representative of "the half barbaric, half elegant, wholly generous and free-handed life" of the Californians. In effect, Ramona offered a historic romance to recapture in the twentieth century a vision that was reinforced by the emerging Arts & Crafts ethos of simple living. 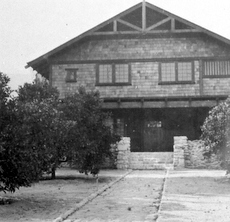 We do not know if Easton was influenced directly by Ramona, but he drew similar inspiration from a much more immediate source: Charles and Henry Greene's newly constructed Arturo Bandini house (1903) on East San Pasqual Avenue. This modest redwood house was pivotal in Easton's development and, for that matter, the architecture of Southern California. The Greenes showed how Hispanic and Yankee building traditions could be united. It was modeled on the colonial U-shaped courtyard house, but instead of adobe the Bandini house was built of native redwood and stone and employed standard wood frame construction. Bandini insisted the house be the Mexican courtyard type with verandas on three sides. The Greenes' design was a single material inside and out, like an adobe, but the walls were sheathed in natural redwood, freshly milled, board and batten. Local river rock boulders were used for fireplaces and chimneys. The Greenes dispensed with "Mission Revival" clichés while retaining the historic type. Charles Greene insisted: "It is all of wood and very simple—not the so-called Mission style at all." The house was also much less expensive to build than those with conventional features, finishes and ornament. For Easton, this was the most compelling breakthrough. 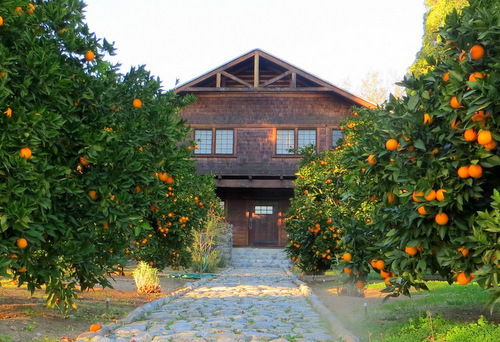 The Bandini house opened the way for creative interpretations of California's natural and Hispanic past, and showed how building traditions could respond to local conditions. Easton admired the Greenes' work. 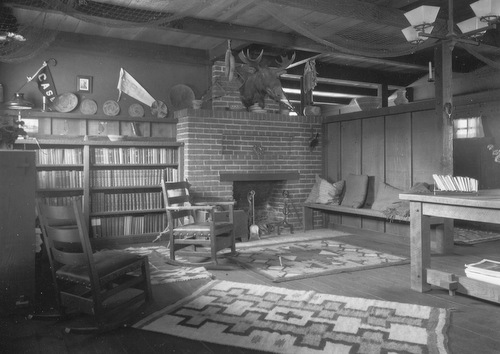 In the family album he included photographs of their houses-- the Gamble house under construction and newly-completed Freeman Ford house-- among his own projects. An opportunity for Easton to explore this new direction came when he met Carl Curtis in 1906. Curtis was a recent graduate in electrical engineering from Case Polytechnic Institute in Cleveland. He headed west in search of a job but like so many Midwesterners, once he saw California, abandoned his plans for a desk job. A more energetic and varied life outdoors was just too compelling. Curtis bought vacant land in the Altadena foothills above Pasadena. He intended to build a ranch and raise chickens, but switched to pedigreed dogs. The Eastons' eldest daughter, Helen Easton Starbuck, remembered that her father met Curtis one afternoon in front of the house on South Marengo Avenue. It was soon after the two houses had been completed, and Curtis was impressed. He discussed with Easton his plans for the Altadena ranch. Helen saw her father pull a pencil and envelope from his pocket and sketch the house while the two talked. She said the sketch was essentially what they later built. The incident was characteristic of Easton--his informal, can-do attitude, his willingness to jump in and solve a problem. It also shows how building traditions once worked. Common practices, conventions, and expectations of a building tradition resided in the minds of all participants—client, designer and builder. In this case, all it took was a simple sketch for everyone to see the design. The land Curtis bought for his ranch was four miles north of Pasadena, today the northeast corner of North Lincoln Avenue and West Ventura Street. After a gradual uphill drive, the mountains rose abruptly ahead. The Curtis property was open with citrus groves surrounding it. On a clear day one could see the Pacific Ocean at Santa Monica, twenty-five miles away. Curtis camped on the site during construction and worked alongside Easton and his small crew. The house they built in 1906 was a simple rectangle with five rooms and a continuous porch across the front facing west. An ell-shaped stable, chicken house and kennel were built east of the house forming a work court. 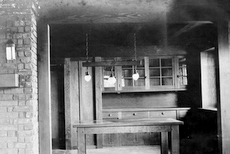 Years later Curtis added a small bunkhouse southeast of the main house. This structure and its garden are the only parts of the ranch that remain. The rest was subdivided, and suburban houses built after World War II. In the 1908 article for Country Life in America, Carlyle Ellis described these rustic buildings—which Easton enjoyed calling shacks—as "appropriately rugged, a veritable oasis in a desert of sage and sunflowers." Easton told Ellis the structural materials for his houses were also the finishes. In his view, "the trouble most people had when they tried to build a simple house at low cost arose from their subservience to studding, lath and plaster, paper and paint." Instead of conventional 2 x 4 stud walls with lath and plaster, Easton used a light structural wood frame with corner posts and board and batten sheathing. Another Easton client, Laura Rinkle Johnson, wrote in a 1912 article for The Craftsman: "There are no 'fake' beams or posts in the house; every stick of timber is just what it appears to be, and does just what it seems to be doing." Without additional finishes, this was surely the cheapest way to build. For the Curtis house Easton used old-growth, clear redwood 12" wide vertical boards for board and batten siding. Boards were joined on both sides with 1 x 3 battens. A horizontal brace was attached to interior walls at plate rail height. Above this were one-quarter inch thick panels wrapped in a heavy monk's cloth. There was no insulation and only one inch of redwood separating the interior from exterior. Ceilings were made of half inch thick redwood shiplap supported by rafter ties. Floors were pine or fir and stained dark. All the Curtis ranch buildings had simple gable roofs and the same board-and-batten siding. They were easy to disassemble and modify, and Curtis continued to tinker with them through the 1930s. Unaffected by changing tastes, his additions were identical to the original 1906 buildings. Perhaps, more than anything, it was Southern California's mild climate, native landscape and fragrant gardens that elevated these simple cottages to a state of luxury. Architect Irving J. Gill, writing in The Craftsman in 1916, praised their virtues: "Redwood houses look as natural a part of the forest and canyon as a tawny mushroom or gray stone... Everybody... lives therein happier than a king, enjoying a simple, free life, breathing eucalyptus and pine-scented air, resting full length in flower-starred grass, bathing in the fern-bordered streams." Easton's drawings and office records have not survived. During the twelve years he lived in Pasadena, he designed and built perhaps twenty-five houses. He promoted his design-build services offering a "maximum of effect with the minimum of expense." This led some to call him "the poor man's architect," which really meant he was an architect for the middle class. As with Curtis, Easton worked directly with clients, drew minimal plans, developed budgets and managed the projects. Their success depended upon strong craft traditions and resourceful workers—not subcontractors, but a small crew who labored together from start to finish building one house at a time. A classic Easton project, the J. Constantine Hillman house built on California Terrace in Pasadena, was issued a building permit October 2, 1907. An article in the Pasadena Star on December 4, 1907 confirmed that "Mr. Hillman with his family will take possession of their new home this week." It took Easton and his crew only two months to build the entire house! Today, even a small remodel can take over half a year to complete. Easton's idea of a "simple home" had so reduced labor that a five-room house built with hand tools could be finished in a couple months. Carlyle Ellis wrote in his 1908 Country Life article that Easton "allowed his plans to be purposely vague until they were visibly before him..." Construction drawings for the Hillman bungalow have survived. They consist of only two 12 x 18 inch linen sheets with tiny floor plans and elevations drawn in ink, 1/8" = 1'-0". From these minimal drawings, Easton's three-man crew built the three-bedroom one-bath house with library and dining room built-ins, brick fireplace, custom redwood furniture and hammered copper light fixtures. We can assume drawings were not necessary for much of the work, nor were they required as "contract documents," as they would be today. Easton's daughter, Mary Easton Gleason, recalled visiting her father at one of his houses under construction. She found him sitting on an unfinished floor, leaning against the wall with a drafting board over his knees. He was just working-out some details before he could continue. Easton's preference to allow his designs to evolve during construction produced houses uniquely adapted to their sites. 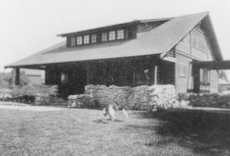 A good example was the 1908 ranch house built for Laura Rinkle Johnson and her family. The site was the former San Pasqual Ranch, down the road from Charles and Henry Greene's Bandini house. It was a five-acre parcel that included three acres of orange groves and twelve live oak. "The completed home," Johnson wrote in The Craftsman, "seems just as much a part of the landscape as the oak trees whose branches spread protectively above the roof." Easton's now familiar shacks rested lightly on the ground and enclosed a garden to the south. Along the north side of the house, facing the San Gabriel Mountains, Easton built a brick-paved and covered veranda. Protected from the sun, this porch served as an outdoor living room in the hot summer months. Johnson described her delight in sitting on the veranda, surrounded by native and exotic plants, and watching birds come to the reflecting pool. It could have been a passage from Ramona. Inside, the house was only one room deep, ensuring good light and cross ventilation. The breakfast room opened to morning sun, and the dining room windows framed a distant view of Mount Baldy. 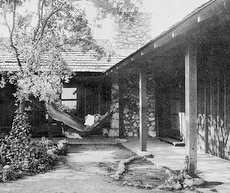 The 1907 Caldwell-Fairbank house that Easton built in Sierra Madre was also published in The Craftsman in March 1908. Foundations for a new house had already been placed when Easton was called in. The owners, S. M. Caldwell, and her daughter, Lillian Fairbank, decided to scrap the first design, a Queen Anne shingle style house with a two story octagonal tower. They asked Easton for a less elaborate design that would fit the existing foundation. 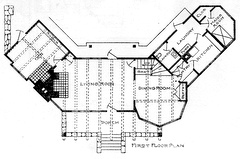 Easton's design opened principal rooms to one another and to the outdoors. It included a recessed front porch with a deep overhang to face south, and in the back a shaded courtyard with fountain and second floor balcony to face the mountains. Easton took out the servants' stair and formal entry hall to open the space and allow the house to be only one room deep. He recommended native materials for the exterior— redwood, cedar and granite— to be in "harmony with the tawny landscape." Easton's themes were all represented in the completed house: rugged simplicity, classless informality, balanced light and cross ventilation, an easy flow between indoors and outdoors, and indigenous materials to create harmony with the site. The Caldwell-Fairbank house was a competent and fully integrated design. Within only a few years, Easton had developed an impressive range of architectural skills. True to his upbringing, Easton was most satisfied with a job well done by simple means. He did not attract clients seeking status, but people who wanted a modest home with a strong connection to the site. Simplicity was understood as a value statement, a chosen lifestyle, and did not indicate a lack of resources. Most of Easton's clients actively participated in the design and construction their homes to make them truly their own. 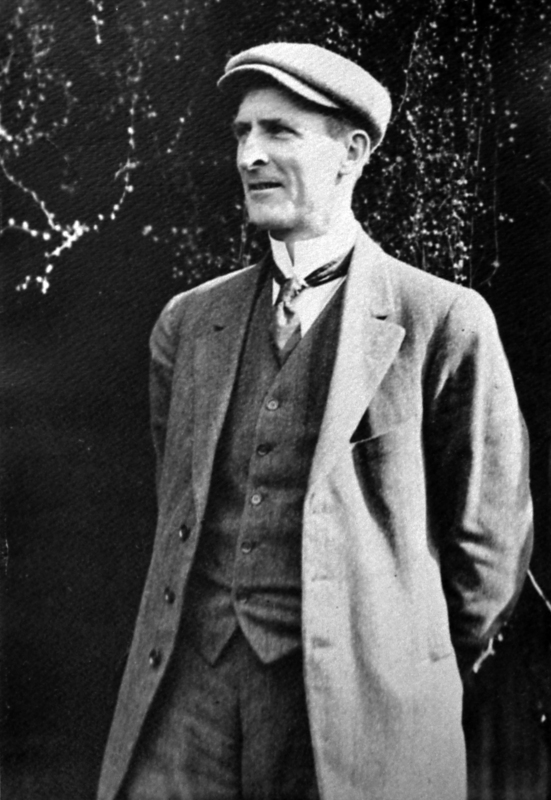 By 1911, Easton had achieved a local reputation and his work was well regarded. Even professional architects admired his simple houses. In that year the prominent architect Myron Hunt hired Easton to design and build a beach house for his family at Clifton-by-the-Sea (now Redondo Beach). Easton and Hunt rode the interurban streetcar from Pasadena to downtown Los Angeles, and then took another Red Car to the beach. 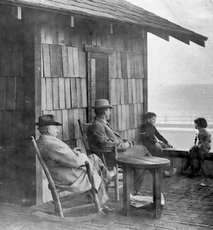 A 1911 photo shows the two on a chilly winter day at the beach, bundled in their overcoats, with two of Easton's children. The photo from Easton's album probably recorded completion of the project. Perhaps with Hunt's influence, Easton was included in the 1913 Los Angeles Architectural Club exhibition. His name was listed in the annual as an "Architect." Within a brief decade the high school manual arts training teacher had advanced to architect in the eyes of the profession. The houses Easton built during those ten years gave clear expression to the Arts and Crafts ideals of integration, harmony and solid workmanship--the same values he impressed upon students at Lemont High School. After the outbreak of war in Europe in 1914 and a worldwide financial panic, building activity in Pasadena virtually stopped. With no work, the Eastons decided to exchange their Pasadena house for a small ranch in Anaheim. Easton was not in good health. His respiratory problems from asthma were getting worse, and the family believed that breathing redwood sawdust on construction sites had contributed. It was early November 1914 when the Eastons arrived in Orange County to take up farming. Easton's health continued to deteriorate. Unable to do much work on the ranch he died in 1921 at the age of 57. Honor sold the farm for a ten-acre orange ranch on Harbor Boulevard. It was swept away in the mid-1950s for a Disneyland motel. Many of Easton's Pasadena houses have also been demolished. The first ones he built on South Marengo Avenue have survived, but are now on a busy arterial and surrounded with multi-family development. Their relationship to the region's romantic past and Garden of Eden landscape is no longer evident. For us, Easton's surviving houses are a poignant reminder of his desire to build appropriately for California, to reconcile vernacular building traditions and native materials with Hispanic precedents and to somehow create from common sense a common culture. Living room and study of Easton's first house with furniture he designed. View from dining room to living room with brick fireplace in Easton's first house. 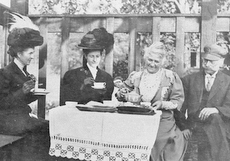 Honor Easton (second from left) at tea party, ca 1910. In Pasadena simple living did not exclude Midwestern rituals, hats or gloves. 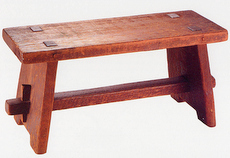 Easton-designed bench from Curtis ranch, 1906. Photo courtesy of Barbara Curtis Horton. 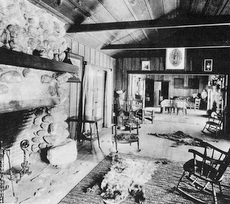 Mead house living room as it was restored in 1980. The house was not protected by a preservation easement. Sadly, the interior was later stripped and our restoration undone. This was something we never anticipated. The new farmers in Anaheim, not far from the future Disneyland. Elbert Hubbard with his parents and the Eastons' daughter (center) at the family homestead. 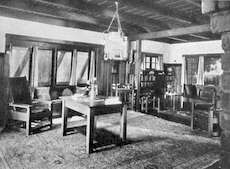 530 S. Marengo house, Pasadena, 1906 View of dining room with built-in buffet, table, and light fixtures designed by Easton and his crew. Easton's Caldwell-Fairbank house in Sierra Madre was also protected by local ordinance and a designated a City Landmark. This was largely due to the perseverance of its owner and restorer, Donald Songster, who preserved the house for many years. We are grateful for these and other efforts to maintain Easton's legacy, allowing future generations a glimpse into this remarkable period of gracious and simple living. Easton has been a longtime interest. This essay evolved from a talk I gave at the Arts & Crafts Weekend for Pasadena Heritage in 2005. An earlier version appeared in Toward a Simpler Way of Life: The Arts & Crafts Architects of California, edited by Robert Winter, pp 149-158 (1997). In 1979, Easton's 1910 W.L. Mead house in Pasadena at 380 West Del Mar Boulevard was purchased by Phil Elkins. His plan was to restore and upgrade the house for contemporary living, and then sell it to someone willing to become its steward. 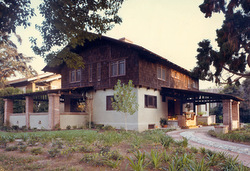 Elkins had recently restored his own house, the remarkable 1912 Lacey bungalow designed by Sylvanus Marston in Altadena. Elkins assembled a group of craftspeople, mostly young people from his church, for the project. Many continued to work with him on the Mead house. Elkins was aware of our recent exhibition and book, California Design 1910, and asked us to provide architectural services for the project. When the work was complete our friends, Arts & Crafts collectors Jim and Janeen Marrin, furnished the house in period style for an open house. Photographs of the restored house appropriately furnished were featured in the Los Angeles Times Home magazine that Sunday, and the public invited for a free tour. We arrived an hour early to prepare the house and found hundreds of people already lined up on the sidewalk waiting to get in. The enthusiasm and overwhelming response that day made clear attitudes were shifting. The Arts and Crafts Movement was relevant once again. Within a next few years Easton's house at 540 South Marengo was threatened with demolition for a condo development. Fortunately, Pasadena Heritage was ready to step in. They set up a revolving fund to purchase, renovate and resell the house to a new owner with a preservation easement. The City of Pasadena supported efforts to preserve historic houses on South Marengo Avenue by creating an office overlay for the multi-family zone. The designation allowed houses to be converted to office space, thereby providing an economic incentive for preservation. Mead house as restored in 1980 with new porte cochere and drive. 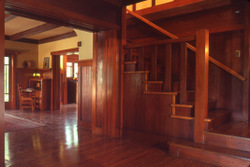 Mead house entry with redwood paneling as restored in 1980.